Reedah: How does it work? Go to our Signup page to create an account. All you need is a valid email address. 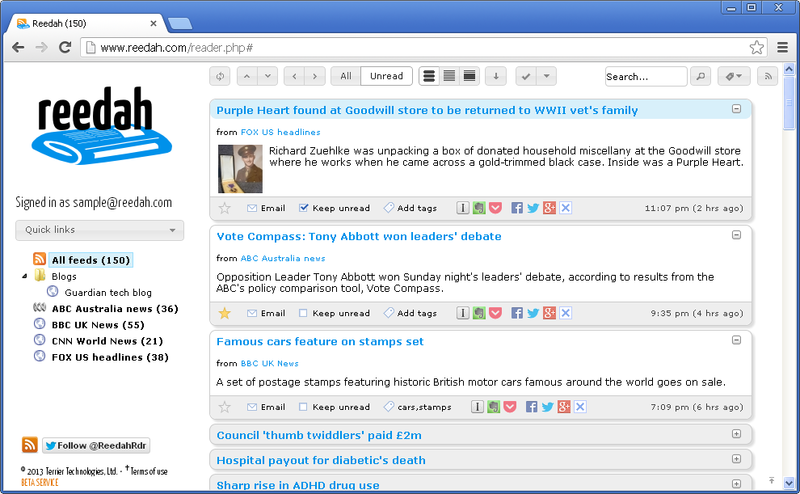 Subscriptions saved from Google Reader (an 'OPML file') can be imported into Reedah. Much as you would have done on the Google Reader web page (screen shot). Tell your reader apps to use Reedah rather than Google Reader. Read your feeds without skipping a beat - using the same reader apps as you did before. * In many cases, you can get the app to work with Reedah using a hex editor. You may also be able to get existing apps to work by changing some settings on your device. See our Common questions page for more details.